I live in an apt. and feel fortunate to do what I want back here. We had late frosts plus I'm lazy so this is my start around June 1. This area used to flood when it rained and was otherwise just mud and weeds. The woods gets flowers of it's own and by mid summer the vines will hang down to the ground if I let them. 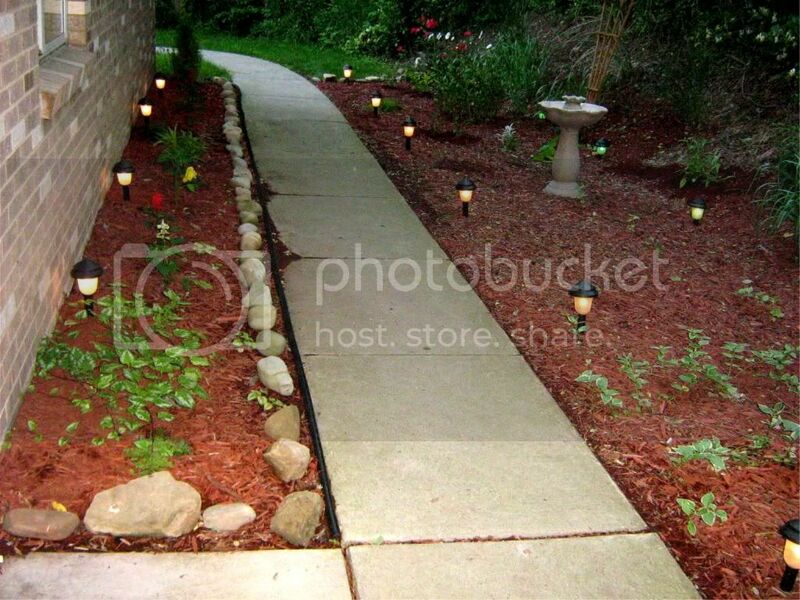 Neighbors have donated lights, rocks and mulch. Great job. It's fun watching gardens year to year as the plants mature and begin to fill in. To me that's especially rewarding. A new daylily I received in a trade from a local woman last year. I rooted some hibiscus and gave it to her. She told me it would be an orange, and I wasn't all that excited until I saw it bloom. Yes, it's as large as it looks. I figure 6-8" across easily. 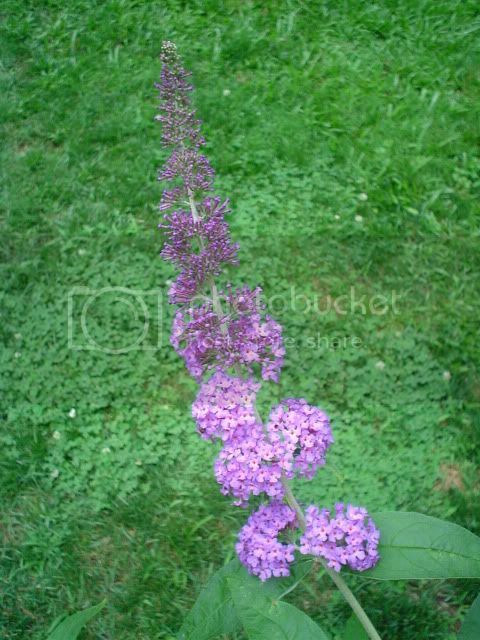 And the butterfly bushes are just getting started. This bloom spike is about a foot long. I grew these plants last year from seed. This is their second summer. The tallest one is about 7' tall now. 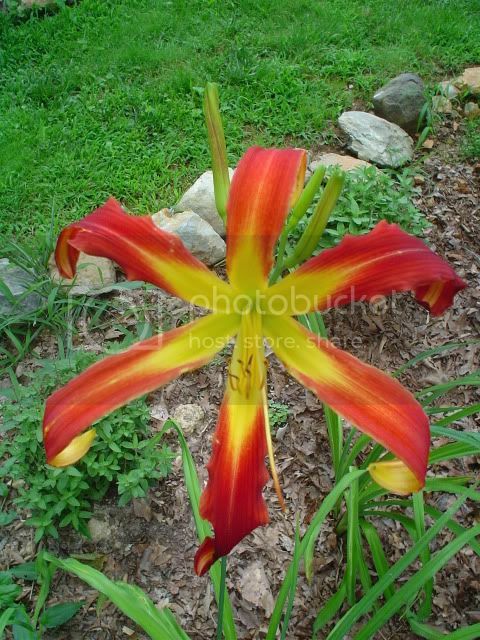 WOW- what a day lily! Beautiful daylily, paperhouse! I've got some similar shaped daylilies, but they're a creamy yellow color. They'll probably be opening in about a week. They were included in a hybrid daylily collection I bought about 15 years ago through Spring Hill catalog. They're my favorites, because they're so unusual. Ghengis, the lupines picture is especially beautiful! I can't get lupines to grow in my soil. I'm envious! Citydweller, your photo #2 looks like coral bells. Cunucu, your pics are gorgeous! There are so many lovely pictures to comment on. Thank you for sharing, everyone! Keep 'em coming! We've had tons of rain the past couple of weeks, and my garden looks like it's going to burst forth into a riot of color any day now. I can't wait! this makes it easy. I agree ! We had a cold winter here in Central Fla and my camillias bloomed out into April. The first year ever for that to happen. They were breathtaking. I am having trouble with Pest control companies trying to find a reputable one to spray my camillias. the stories I could tell. Last edited by AnnieA; 06-10-2010 at 09:05 PM..
Day lily - I transplanted some from an old, uninhabitable house in the neighborhood (I live in an old farm area). They must be decades old. They always come up orange but this year there is a cream colored one in the bunch!! Another mutation, I spoze, like the white peony that bloomed this year in my fuchsia ones. Red geranium. 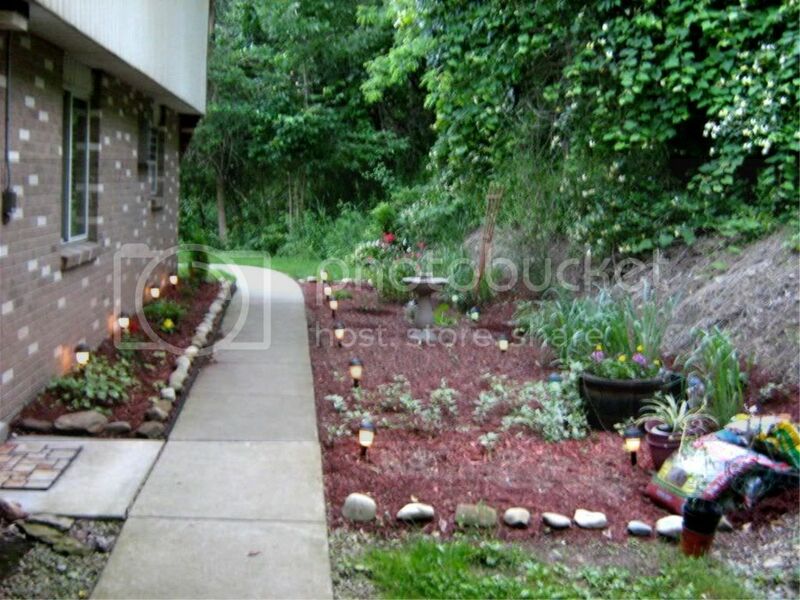 - it spends the winter indoors and then back outside every summer until early fall when the first frost comes. That's an old chamber pot it's planted in. 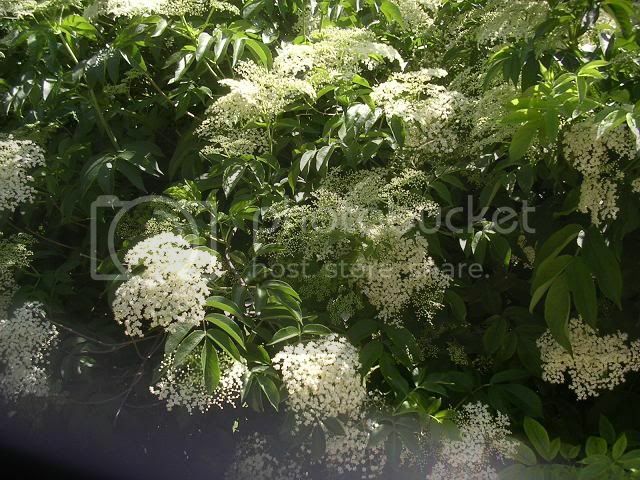 Elderberry blooms - I have three bushes and get enough berries from them to bottle about 36 bottles of elderberry juice which will last me an entire year. Very pretty. Love the elderberry! I think I'm actually going to be able to keep my 'Sutherland Gold' elderberry alive this year! It's so pretty.